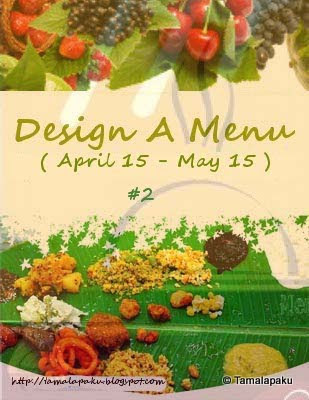 Here comes the second edition of Design A Menu with a new set of ingredients. So Please send in your innovative menus with at least one recipe to participate. Many thanks to all of you who have sent in your innovative menus and creative recipes to the event. We shall post the round up very soon but for now, take a look at this month's edition of the event. For more details and history behind 'Design A Menu' check here. What is 'Design A Menu'? The idea of this event is to create a menu for a 3 course pure vegetarian meal (Appetizer, Main Course, Dessert) including all the ingredients below. Feel free to use the regular spices, seasonings, salt and sweeteners that might be required. No eggs please!! Rice and/or Roti, Milk and/or Yogurt are assumed to be available. 1. Design a sample menu using ALL the listed compulsory ingredients [making sure each item has at least one compulsory ingredient as a main ingredient], cook and post one or more recipe(s) from the menu you have designed, between Apr 15th 2011 and May 15th 2011. (Make sure the menu is part of the post too). 2. Please link back your entry to this announcement page. 3. No archived entries please. 4. Usage of the logo is mandatory. 6. Non bloggers can email us the recipe and I would include them in the round up after the completion of the event. Please note that you don't have to make all the items from the menu designed. We hope to receive many creative menu ideas and recipes. Great Event. I will certainly try and come up with some nice recipes. Good luck with the event. Cant wait to design a menu with these new ingredients,will send mine soon..
Will try to send an entry. last time I missed it but this time will sure send some . Nice choices dear, happy hosting.